In 1959, Bethlehem’ Sparrows Point plant, outside Baltimore, was “the largest steelworks in the world.” In its heyday, it employed 36,000 workers. Bethlehem went into bankruptcy in 2001, and many of its retirees at the “Point” got screwed out of their benefits. 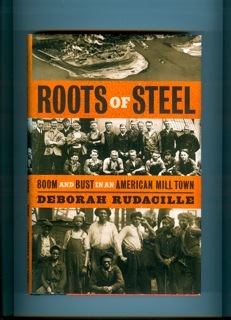 Deborah Rudacille’s book, “Roots of Steel,” recreates, via compelling “oral histories,” the history of the Point; the collapse of Bethlehem, an industrial titan; and the baleful impact that it had on the lives of its union workers and communities that they lived in. In “Roots of Steel: Boom and Bust in an American Mill Town,” Deborah Rudacille vividly recreates the lives of the workers who lived in the company town of Sparrows Point, aka the “Point,” and the surrounding community of Dundalk, Maryland. During WWII, as many as 36,000 were employed at the sprawling facility, then owned by the Bethlehem Steel Co. and located on the water’s edge, just east of Baltimore, where the Patapsco River meets the Chesapeake Bay. When I was on the waterfront as a longshoreman, (Local 829, ILA), back in the late 50s, I recall working on cargo ships docked at the Point. The vessels would load up with steel plates and pipes, and head, via the Panama Canal, for the West Coast ports; such as Portland, Seattle and Long Beach. You had to go through the town of Sparrows Point to get to the terminal. Steelmaking, I noticed, gave off an extremely bright, reddish glow. I wondered as I walked to the dock area, how the men working near the “coke ovens,” for example, could stand the intense heat, later measured by OSHA inspectors, “at 127 degrees,” according to author Rudacille. Just imagine what it was like during the barely tolerable dog days of July and August in the Chesapeake Bay region. The Point was so immense, measuring about four miles from end to end, that it had its own railroad, dispensary, sports’ teams and police force, too. It was an autonomous world. What about the working conditions at the Point? Think--mostly appalling! Ms. Rudacille shows that, in the pre-WWI period, “thirty-nine men were killed on the job and fifteen disabled” in a four-year period with no Workers’ Compensation benefits. And even as late as 1947 to 1952, there were “an average of five deaths per year.” Behind every statistic, Rudacille underscores, there was “a grieving family.” It was only after OSHA, a federal agency, arrived that safety concerns at the Point improved. When Bethlehem went belly up, in 2001, it was a federal agency, the “Pension Guaranty Corporation,” which gave some relief to the Point’s retirees. This was a measure championed by Liberals, and not egregious labor-bashers, like Ronald Reagan. (3) “The retirees,” Rudacille said, “were very bitter,” over the deal that permitted Bethlehem to discharge its pension, health and life insurance obligations to the retirees in the bankruptcy proceedings. Eventually, the buyer, ISG, paid $1.4 billion “to take over all of Bethlehem’s property,” including the Point. Rudacille details the economic loss, the trauma, the psychic blows, that the collapse of the Point had on its workers, retirees, the USW and the community. And, if that wasn’t bad enough, the area also saw “Lever Brothers, General Motors, Crown Cork and Seal, Eastern Stainless Steel,” pull up stakes and leave town. Finally, Ms. Rudacille interviewed 45 individuals for her book, including an ex-USW official, Ed Gorman. The vast majority of her sources were Point retirees. (7) Their compelling “oral histories,” and much more, about the rise and decline of the Point as a steelmaking behemoth, are what makes her well researched tome, a must-read for area residents, social historians and Labor buffs alike. 1. Austin McLelland, a Point retiree, was one of 45 individuals who were part of the “oral histories,” that are the crux of the book. 2. In the late 50s, I went to work at 7 PM, at the Point’s maritime terminal, parking on one of its lots. It snowed that night. When I got off around midnight, it took me over an hour to find my car! 7. At least two of the 45 individuals interviewed by the author are Labor historians and educators, Bill Barry and Roderick Ryon. Another one of Rudacille’s sources was the Hon. Kenneth L. Johnson, a retired judge of the Circuit Court of Baltimore. In his early days at the Bar, then-attorney Johnson was a Civil Rights’ litigator, par excellence.